Foreclosure 2 Fabulous: Free Trees? Yes Please! Okay, so I totally didn't mean for that to rhyme. But I'll take it! So generally we despise Pepco, our electric provider - for several reasons. For one, when we first moved here our power went out if someone sneezed too hard in a 5 mile radius. This is better now though, so thanks Pepco. Second and more importantly - they BUTCHER our trees. Like seriously they massacre them to keep them from touching the power lines. However, at least for today Pepco gets some kudos from F2F because they're providing 2,000 free trees to people in their coverage area! 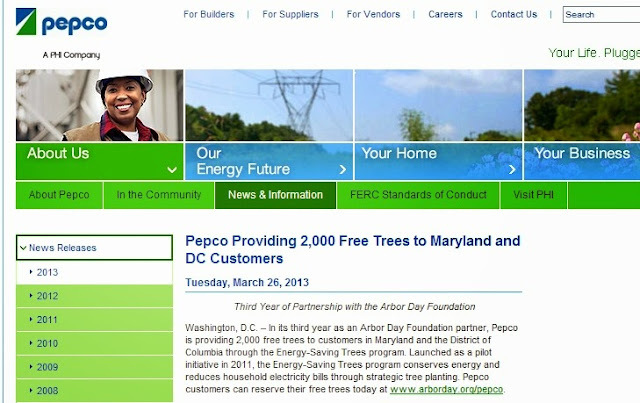 Go to this link: Free Pepco Trees and reserve yours today! There were 1,661 left when I reserved our two redbud trees! Thanks Pepco! Hi, Very beautiful and colorful images in your web blog.